Photolabile fragrance storage substances are described, which are capable of photoinduced release of odorant aldehydes and odorant ketones. Additionally described are a process for long-lasting fragrancing of surfaces and a process for producing the fragrance storage substances mentioned. The present invention relates to compositions which comprise at least a certain .beta. hydroxyketone, which can release a carbonyl compound when exposed to electromagnetic radiation, in particular, such as preferably stoffketon a fragrance aldehyde or a fragrance. 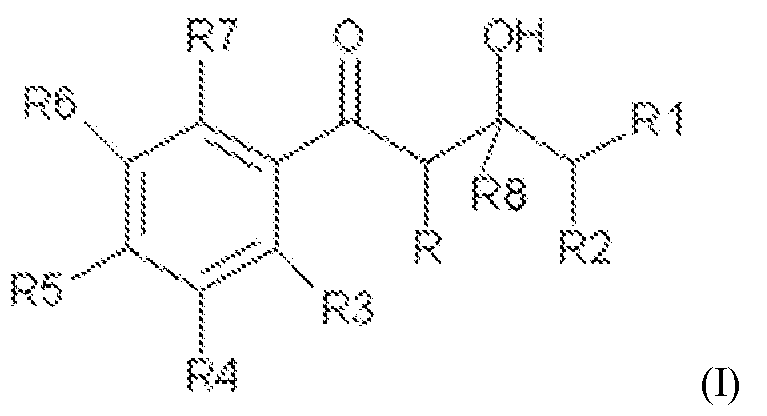 It further relates to a method for the release of Riechstoffaldehyden or Riechstoffketonen from certain beta-hydroxy ketones. It further relates to a method for long-lasting perfuming surfaces. It concerns the use of certain .beta.-hydroxy ketones as fragrance precursors in detergents and cleaning agents, in cosmetic products as well as air fresheners. Textile and surface treatment agent or cosmetic products usually contain fragrances (perfumes), which give the agents a pleasant and fresh scent. The terms perfumes and fragrances are used interchangeably in this invention. The fragrances mask while mostly the natural scent of the other ingredients, so that a positive odor impression with the consumer. In the area detergent fragrances are particularly important constituents of the composition, since the laundry should have a pleasant and fresh smell in both the wet and the dry states. A fundamental problem with the use of fragrances as being between that it is at these concerns volatile substances, otherwise no fragrance effect could be obtained. However, one the other hand, seeks to provide long-lasting as possible and consistent fragrance effect. is known for example that the scent impression of a perfume over time changed because the fragrances that represent the fresh and light notes of perfume evaporate more quickly due to its high vapor pressure than the perfumes that represent the middle and base notes. One approach to solving this problem, namely to achieve a long-lasting as possible and consistent aroma effect is to deposit fragrances on carrier materials and to coat the perfumed carrier, or to encapsulate perfumes or store them into compounds (for example, cyclodextrin-perfume complexes). Furthermore, the possibility exists to bind the fragrances chemically to support media, the chemical bond is cleaved slowly and the fragrance is released as a result. One such carrier-bound precursor of a fragrance is also referred to as "pro-fragrance" or fragrance storage substance. 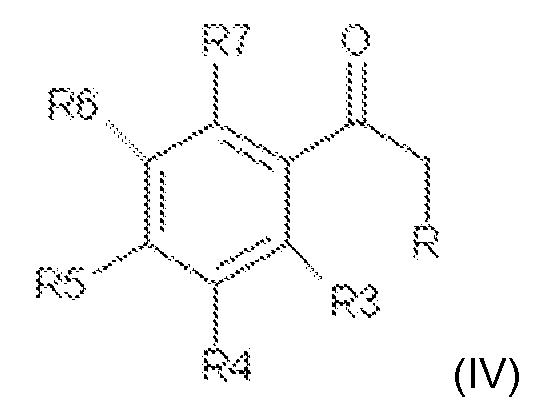 In this context, international patent application WO2007 / 087977 discloses the use of 1-aza-3,7-dioxabicyclo [3.3.0] octane compounds as a fragrance storage substances for sustained release of fragrance aldehydes and fragrance ketones by hydrolysis. an alternative way of sustained release of fragrances, the use of so-called photoactivatable substances as fragrance storage substances. Due to the action of sunlight or another source of electromagnetic radiation of a certain wavelength of the breaking of a covalent bond is induced in the fragrance storage substance molecule, whereby a fragrance is released. the process described has to tolerate the presence of oxygen and water for the effective release of the fragrance. 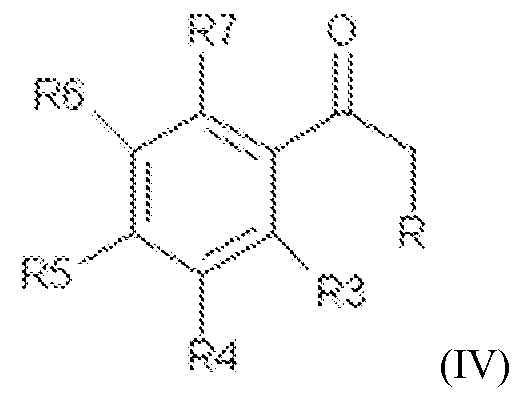 In this connection, US Patent 6,949,680 discloses the use of certain phenyl or pyridyl ketones as photoactivatable substances that release in the presence of light in a photochemical fragmentation of a terminal alkene, as an active substance. Said active substance, for example, has a fragrance-imparting or antimicrobial activity, which is only delayed by the photochemically induced decomposition and released over a prolonged period of time on a particular surface. The photolabile said phenyl or pyridyl ketones are produced as a fragrance storage substances in a complex, multi-step synthesis methods with the use of protective group operations, the synthesis for each active ingredient should be adjusted individually. The object of the present invention was to provide a delayed release of fragrance aldehydes (Riechstoffaldehyde) and fragrance ketones (Riechstoffketone). Surprisingly, it has now been found that a composition comprising certain described below beta-hydroxyketones, the sustained release of fragrance aldehydes (Riechstoffaldehyden) or Duftstoffketonen (Riechstoffketonen) allowed. wherein, in this formula, independently of one another, R and R8 o stands for a hydrogen atom or an organic radical, in particular a linear or branched, substituted or unsubstituted alkyl or alkylene group from C 1 to C 2, but preferably stands for a methyl radical and wherein R1 and R2 independently represent a hydrogen atom or organic radicals, such as in particular a linear or branched, substituted or unsubstituted alkyl or alkylene group from C 1 to C 2 o, preferably C 4 to C 2 o, wherein the R1 and R2 together also can residues form a ring system, in particular an unsubstituted or substituted mono- or polycycloalkyl group of C 3 to C 8, or may represent an unsubstituted or substituted phenyl group, and wherein R3, R4, R5, R6 and R7 independently represent hydrogen , halogen, NO 2, a linear or branched, substituted or unsubstituted alkoxy group having 1 to 15 carbon Atoms or a linear or branched, substituted or unsubstituted alkyl group having 1 to 15 C atoms. The invention also enables the extension of the scent effect of other fragrances, which are also included in the composition. It also enables the achievement of a long lasting fresh smell. It facilitates the long-lasting scenting of surfaces. It allows a controllable, photo-induced release of Riechstoffaldehyden and Riechstoffketonen. in which formulas (II) and (Ml), independently of one another, the radicals R, R1, R2, R3, R4, R5, R6, R7, R8 are defined as in connection with formula (I) previously indicated. It is based on the formula (M) are preferred if the radical R is a linear or branched, substituted or unsubstituted alkyl or alkylene group from C 1 to C 2 o, but preferably represents a methyl radical. Based on the formula (Ml), it is preferred if the rest of R8 o stands for a linear or branched, substituted or unsubstituted alkyl or alkylene group from C 1 to C 2, but preferably represents a methyl radical. The formulas (M) and (IN) form from simple subsets of the formula (I). Further preferably, a compound of the invention of the general formula (I) in which four of the five aryl substituents R3, R4, R5, R6 and R7 is hydrogen. Are preferably each R3, R4, R6 and R7 for hydrogen, while the substituent in the para-position R5 is preferably a halogen atom, NO 2, a linear or branched, substituted or unsubstituted alkoxy group having 1 to 15 carbon atoms or a linear or branched, substituted or unsubstituted alkyl group having 1 to 15 carbon atoms. In a highly preferred embodiment of the invention R 5 is comprised of 1 to 4 carbon atoms, -Cl, -Br, -NO 2 or an alkyl or alkoxy group. Preferably, in the linear or branched, substituted or unsubstituted alkyl group is a methyl or ethyl group and / or wherein the linear or branched, substituted or unsubstituted alkoxy group is a methoxy, ethoxy, isopropoxy or tert-butoxy group. A substitution in the para position (R5) is particularly preferred since the electronic structure of the aromatic ring can be most effectively modified here, whereby the absorption maximum of compounds of general formula (I) can be easily adapted to a particular wavelength. Also preferred is a compound of general formula (I), in which all five aryl substituents R3, R4, R5, R6 and R7 are hydrogen invention. The foregoing with respect to the general formula (I) and the five aryl substituents R3, R4, R5, R6 and R7 are of course applies equally to the general formula (II) and (IM). Upon exposure to electromagnetic radiation, in particular comprising the wavelengths of 200 to 400 nm can, said beta-hydroxy ketone of general formula (I) according to the invention preferably a fragrant carbonyl compound, ie, a perfume ketone or aldehyde release. As electromagnetic radiation in the context of the present invention can be preferably used natural sunlight. This of course applies also to the beta-hydroxy ketones of the general formula (II) and (IM). 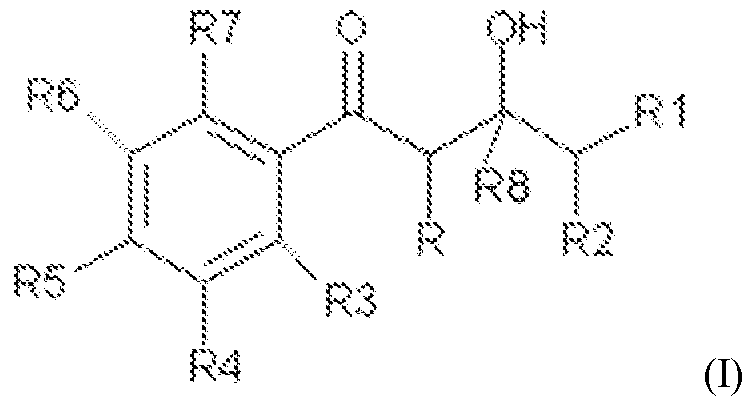 where the radicals R, R1, R2, R3, R4, R5, R6, R7, R8 are defined as before (I) in connection with the formula previously indicated. It is preferred that in the formula (IV) the radical R stands for a hydrogen atom or a methyl radical. It is also preferable that in the formula (V) the radical R 8 represents a hydrogen atom or a methyl radical. The present invention thus allows the selective release of fragrant aldehydes and ketones by the action of electromagnetic radiation, in particular comprising the wavelengths of 200 to 400 nm. Likewise, there is a further preferred embodiment of the invention, when the wavelengths of 200 to 400 nm is a Riechstoffketon upon exposure to electromagnetic radiation comprising at least released, preferably selected from the group consisting of buccoxime; iso jasmone; Methyl beta naphthyl ketone; Musk indanone; Tonalide / musk plus; Alpha-damascone, beta-damascone, delta damascone, iso-damascone, damascenone, damask rose, methyl dihydrojasmonate, menthone, carvone, camphor, fenchone, alpha-ion, beta-ionone, dihydro- beta-ionone, gamma-methyl so called Eonon, Fieuramon, dihydrojasmone, cis-jasmone, iso-E-Super, methyl-cedrenyl ketone or methyl cedrylon, acetophenone, methyl-acetophenone, para-methoxy acetophenone, methyl-beta-naphthyl ketone, benzyl acetone- , benzophenone, para-hydroxy phenyi- butanone, Ceiery ketone or Livescon, δ-isoproρyidecahydro-2-naphton. Dimethyl- propyl octenone, Freskomenth, 4- (l-ethoxyvinyl) -3 1 1 3,5,5 tetramethyl-cyclohexanone, methyl heptenon, 2- (2- (4-Methyl-3-cyclohexen-1-yl) ) -cyclopentanone, 1 - (p-menthene-6 (2) -y!) 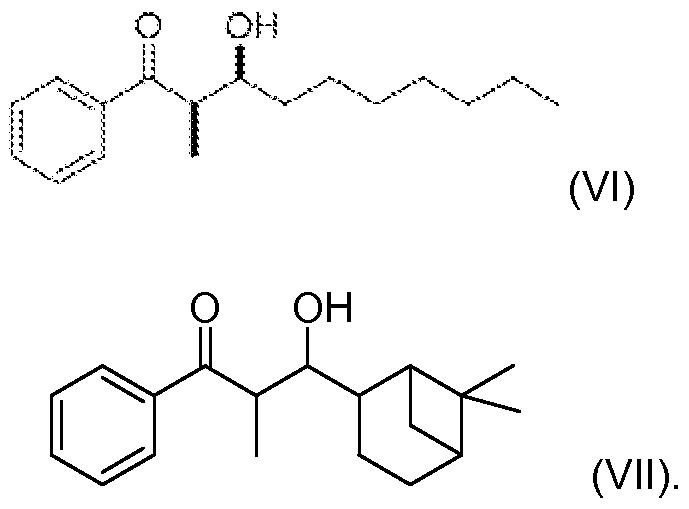 - 1-propanone, 4- (4-hydroxy-3-methoxyρhenyl) -2-butanone, 2-Acetyl-3,3-dimethyl- norbornane, 6,7-dihydro-1, 1, 2,3,3-methyi- ρenta- 4 (5H) -indanon, 4-Damascol, Duicinyi or cassion, Gelson, Hexaion, Isocyciemon e, cyclocitron methyl, methyl lavender ketone, örivon, para-tert-butyl-cyclohexanone, Verdon, Delphon, muscone, Neobutenon, Plicaton, Veiouton, 2,4,4,7-Te.rameihyi-oct-6-en-3-σn, tetra Meran and Hedion. 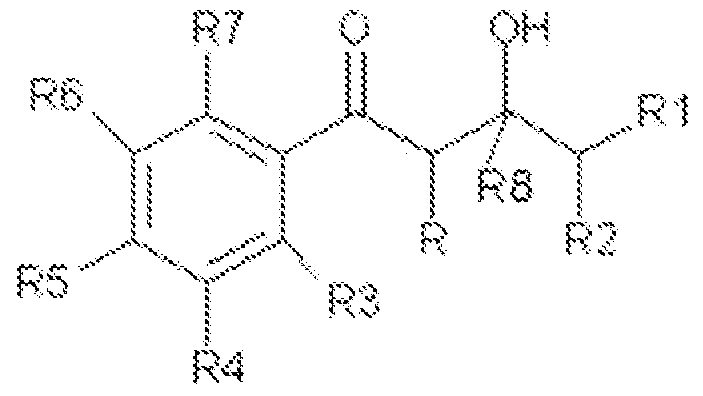 According to the invention releasable Riechstoffaldehyde Riechstoffketone and may have an aliphatic, cycloaliphatic, aromatic, ethylenically unsaturated structure, or a combination of these structures. It can furthermore be present more heteroatoms or polycyclic structures. The structures may have suitable substituents such as hydroxyl or amino groups. The composition of the invention contains beta-hydroxy ketones of general formula (I) preferably in amounts of 0.0001 to 95 wt .-%, based on the total composition. A possible upper limit for the inventive beta-hydroxy ketones in the composition may, for example, even at 80 wt .-%, 70 wt .-%, wt .-% 60, 50 wt .-%, 40 wt%, 30 wt %, 20 wt .-%, 10 wt .-% or, for example, even at 5 wt .-% are based on the total composition. A possible lower limit for the novel .beta.-hydroxy ketones in the composition may lie wt .-%, for example, even at 0.001 wt .-%, 0.01 wt .-%, 0.1 wt .-% or, for example 0.5, based on the total composition. The composition of the invention may comprise further ingredients, such as solvents, carrier materials, more perfumes, dyes, surfactants, etc. The type and amount of ingredients in addition contained is in principle not critical and depends primarily on the intended use of the composition according to the invention in addition to the novel beta-hydroxy ketones. If the composition of the invention, for example, a detergent, they usefully contains customary for detergent ingredients such as surfactants, builders, etc. In a preferred embodiment of the invention, the inventive composition contains at least one additional perfume. Thus, with "additional" perfume substances other than the ß-hydroxy-ketones of the general formula (I) already contained erfindungemäß are meant which can develop a fragrance effect. The preferred additional usable fragrances or perfume oils are any restrictions. Thus, in particular synthetic or natural perfume compounds of the ester, ether, aldehydes (fragrance aldehydes, Riechstoffaldehyde), ketones (fragrance ketones, Riechstoffketone), alcohols, hydrocarbons, acids, acid esters, aromatic hydrocarbons, aliphatic hydrocarbons, saturated and / or unsaturated hydrocarbons and mixtures thereof can be used as fragrances. As fragrance aldehydes or fragrance ketones all conventional fragrance aldehydes and fragrance ketones can be used here, which are typically used to achieve a pleasant scent perception. Suitable fragrance aldehydes and fragrance ketones are known in the art. The fragrance ketones may include all ketones which can impart a desired fragrance or a fresh perception, those which have already been mentioned in the description for example. It can also be used mixtures of different ketones. The ketones may preferably be selected from Alpha Damascone, Delta Damascone, Iso Damascone, Carvone, Gamma-methyl ionone, Iso-E-Super, 2,4,4,7-Tetramethyl-oct-6-en-3-one, benzyl acetone, beta Damascon, damascenone, methyldihydrojasmonate, methyl cedrylon, Hedion and mixtures thereof. Suitable fragrance aldehydes may be any aldehydes which impart according to the fragrance ketones a desired fragrance or fresh perception. There may be individual aldehydes or aldehyde in turn. Suitable aldehydes are, for example, mentioned previously in the text aldehydes. The fragrance aldehydes and fragrant ketones may have an aliphatic, cycloaliphatic, aromatic, ethylenically unsaturated structure, or a combination of these structures. It can furthermore be present more heteroatoms or polycyclic structures. The structures may have suitable substituents such as hydroxyl or amino groups. 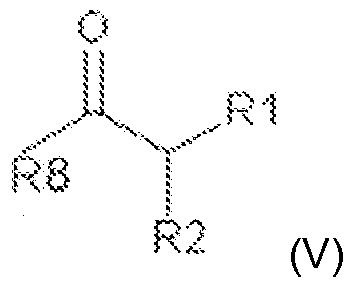 For further suitable fragrances selected from aldehydes and ketones will respectively Steffen Arctander Published in 1960 and 1969, Reprinted 2000 ISBN: Aroma Chemicals Vol. 1: 0-931710-37-5, Aroma Chemicals Vol. 2: 0-931710-38 -3 referenced. Suitable perfumes of the ester type are, for example, benzyl acetate, phenoxyethyl isobutyrate, p-tert-butylcyclohexyl acetate, linalyl acetate, dimethyl benzyl (DMBCA), phenylethyl acetate, benzyl acetate, Ethylmethylphenylglycinat, Allylcyclohexylpropionat, Styrallylpropionat, benzyl salicylate, cyclohexyl salicylate, floramat, Melusat and Jasmacyclat. Fragrance compounds of the type of hydrocarbons are, for example, terpenes such as limonene and pinene. Suitable perfumes type ethers are, for example, benzyl ethyl ether and Ambroxan. Suitable perfume alcohols include 10-undecen-1-ol, 2,6-dimethylheptan-2-ol, 2-methylbutanol, 2-methylpentanol, 2-phenoxyethanol, 2-phenylpropanol, 2-tert-Butycyclohexanol, 3,5,5- trimethyl-cyclohexanol, 3-hexanol, 3-methyl-5-phenylpentanol, 3-octanol, 1-octen-3-ol, 3-phenylpropanol, 4-heptenol, 4-lsopropylcyclohexanol, 4-tert-Butycyclohexanol, 6,8- dimethyl-2-nonanol, 6-nonen-1-ol, 9-decen-1-ol, alpha-methylbenzyl alcohol, alpha-terpineol, amyl salicylate, benzyl alcohol, benzyl salicylate, beta-terpineol, butyl salicylate, citronellol, cyclohexyl salicylate, decanol, dihydromyrcenol, dimethylbenzylcarbinol, dimethylheptanol, dimethyloctanol, ethyl salicylate, ethylvanillin, anethole, eugenol, geraniol, heptanol, hexyl salicylate, isoborneol, isoeugenol, isopulegol, linalool, menthol, myrtenol, n-hexanol, nerol, nonanol, octanol, para-menthan-7-ol, phenylethyl alcohol, phenol, phenyl salicylate, tetrahydrogeraniol, tetrahydrolinalool, thymol, trans-2-cis-6-Nonadienol, trans-2- nonen-1-ol, trans-2-OCTE nol, undecanol, vanillin, cinnamyl alcohol, wherein when a plurality of perfume alcohols are present, they may be independently selected. Fragrances or perfume oils may also be natural odorant mixtures, as are obtainable from plant sources, for example pine, citrus, jasmine, patchouli, rose or ylang-ylang oil. Also suitable clary sage oil, chamomile oil, clove oil, lemon balm oil, mint oil, cinnamon leaves are oil, lime blossom oil, juniper berry oil, vetiver oil, galbanum oil and laudanum oil and orange blossom oil, neroli oil, orange peel oil and sandalwood oil. The fragrances or perfume oils, it may also be essential oils such as angelica root oil, anise oil, arnica flower oil, basil oil, bay oil, Champacablütenöl, silver fir oil, noble fir cone oil, elemi oil, eucalyptus oil, fennel oil, pine needle oil, galbanum oil, geranium oil, ginger grass oil, guaiac wood, gurjun balsam oil, Helichrysumöl, Ho oil, ginger oil, iris oil, cajeput oil, calamus oil, camomile oil, camphor oil, Kanagaöl, cardamom oil, cassia oil, pine needle oil, Kopaϊvabalsamöl, coriander oil, Krause mint oil, cumin oil, Kuminöl, lavender oil, lemongrass oil, lime oil, mandarin oil, melissa oil, ambrette seed oil, myrrh oil, clove oil, neroli oil, niaouli oil, olibanum oil, Origanum oil, palmarosa oil, Patchuliöl, Peru balsam oil, petitgrain oil, pepper oil, peppermint oil, pimento oil, pine oil, rose oil, Rosma- rinöl, sandalwood oil, celery oil, spike oil, star anise oil, turpentine oil, thuja oil, thyme oil, verbena oil, vetiver, juniper berry oil, wormwood oil, wintergreen oil, Ylang-ylang oil, hyssop oil, cinnamon oil, cinnamon leaf oil, citronella oil, lemon oil and cypress oil trade. The total amount of usable added fragrance in the inventive composition is preferably between 0.01 and 5 wt .-%, particularly preferably between 0.1 and 3 wt .-% and most preferably between 0.5 and 2 wt .-% based on the total amount of the composition. Mixtures of different fragrances are preferably used (different from the above-mentioned perfume classes), which together produce a pleasing fragrance note. In a further preferred embodiment of the invention, in the inventive composition is a detergent or cleaning agent, a cosmetic preparation or an air freshener. In the washing or cleaning agent can be an agent for treating textiles in the form of a laundry detergent, fabric softener, softening detergent or washing aid in particular. It may also be, for example, a detergent for hard surfaces such as preferably a dishwashing detergent, in particular a dishwasher detergent. It may also involve cleaning agents such as household cleaners, general purpose cleaners, window cleaners, floor cleaners, etc..
Preferably, beta-hydroxyketone of the general formula according to the invention (I) is in the inventive composition, particularly in the form of a laundry detergent, fabric softener, softening detergent or washing aid, in amounts of preferably between 0.01 and 5 wt .-%, particularly preferably between 0 1 and 3 wt .-% and most preferably between 0.5 and 2 wt .-%, each based on the total amount of the composition. A composition according to the invention, such as in particular washing or cleaning agent may be solid or liquid, said liquid medium, preferably liquid washing or cleaning agent can be preferred. Particularly in the case that the inventive composition is a detergent or cleaning agent, it is preferred that it contains at least one surfactant selected from the group consisting of anionic, nonionic, zwitterionic and amphoteric surfactants. In the event that the inventive composition is a softening detergent ( "2in1"), it is preferred that it contains a softening component and at least one surfactant selected from the group consisting of anionic, nonionic, zwitterionic and amphoteric surfactants. Washing aids are used for the targeted pre-treatment of the laundry before washing with spots or heavy contamination. To the washing aids include, for example, pretreatment, soaking agents, decolorizer and stain remover. In the event that the inventive composition is a fabric softener, it is preferred that it contains a softening component. Fabric softeners are preferred as agents of the invention, as they only in the last step of a conventional textile washing process, the wash cycle, come into contact with the textiles, and thus a particularly large amount of the fragrances can be absorbed onto the fabric, without the risk that the fragrances at subsequent steps are removed. through the use of electromagnetic radiation comprising wavelengths of 200 to 400 nm, where the radicals R, R1, R2, R3, R4, R5, R6, R7, R8 are in turn defined as previously indicated, particularly in applications related to the use of of washing or cleaning agents, cosmetics and Lufterfrischem. In a preferred embodiment of the method used to release of Riechstoffaldehyden, in particular selected from the group comprising Meionai, Tripiai, Ligustrai, Adoxai; Anisaidehyd; Cymai; Ethylvaniiiin; Florhydra ! 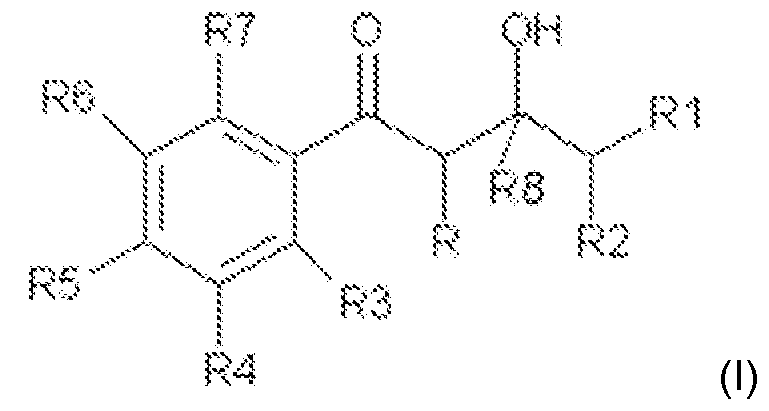 ; Heiionai; Heiiotropin; Hydraxy- citronellal; koavone; laurinaldehyde; Lyrai; Methyl-nonyi-acetaldehyde; ρ, t ~ Bucinal; Phenyiacei- aldehyde; undecylenic; Vaniiiin; 2,6,10-trimethyl-9 ~ undecena !, 3-dodecene-1 ~ al, aipha-n Amyizimtaidehyd, 4-Methoxybenzaidehyd, benzaldehyde, 3- (4-tert-Butyiphenyi) -prapanai, 2-methyl - 3- (! ρara rnethoxyphefiy-propana! ), 2 ~ methyl ~ 4- <2,6,6 ~ trimethyl-2 (1> cyc ohexen ~ 1-yl!) butanal, 3-phenyl-2-prapenal, cis / trans-3,7-dimethyl-2,6 <κstadien-1 in fine, 3,7-dimethyl-6-octene-1-al, [(3,7-DimethyE-6-oc.eny!) oxy] acetaEdehyd, 4-isoprapyibenzyaidehyd, 1, 2,3,4, 5,6,7,8-octahydrσ-8,8- dimethyl-2-naρhthaidehyd, 2,4-dimethyl-3-cyclohexene-1-carboxyaidehyd, 2-methyl-3- (isopropyi- phenyl) propanal, Decyi aidehyd, 2,6-Dimethy -5-heptenai! ; 4- (tricyc o [5.2 1.0 (2.6).] - decyiidene-3} - butanai;! OctahydroJ-methano-IH-indenecarboxaidehyd; 3-ethoxy-4- hydroxybenzaidehyd, para-ethyl-alpha, aipha-dimethyihydrozimtaidehyd, aipha-methyl-3.4- (methyienedioxy) ~ ~ hyd hydrozimtaide, 3,4-MethyienediGxybenzaidehyd, a! pha-n-Hexy! zimtaidehyd, m ~ ~ 7-Cymene CarbOxa! dehyde, aipha-Methyiphenylacetaidehyd, 7 ~ hydroxy-3, 7-dimethyl octanal, Undecenai, 2,4,6 ~ trimethyl ~ 3 ~ cyciohexene-i-carboxaidehyd, 4- (3) (4-methyl-3-pentenyi) -3- cyciohexen-carboxaldehyde. 1-dode ~ canai, 2,4-dimethyl-S-cyciohexene carboxaidehyd, 4 ~ (4-hydroxy ~ 4-methyl-S-ρentyi cyiohexene-1- carboxaldehyde, 7-methoxy-3,7- <Jimethyioctan-1-AE, 2-methyl undecanai !, 2-methyl decanai.1 -nona- NAL 1 -Octanal, 2.6> 10 ~ trimethyl ~ 5 l 9 ~ undecadienai | 2-methyl-S ^ -tertbutyijpropanai, Dihydrozimt- aidehyd, 1 ~ methyl ~ 4- ( 4 ~ methyl ~ 3-pentenyl> -3- cyciohexene-i-carboxaidehyd, 5 or 6 methoxy hexahydro-4,7-methanoindan-1 or 2- carboxyaidehyd, 3.7 ~ dimethyloctan-1-al, 1 -Undecanal, 10- undecen-1-ai, 4- Hydroxy-3 ~ methoxybenzaldehyde, 1-methyl-3- (4-methyipentyl> -3 ~ cyciohexen- carboxaldehyde, 7-hydroxy-3,7-dimethyl-octanal; trans-4-decenal, 2,6-nonadienal, para-Tolylacet- aidehyd; 4- Methylphenyiacetaldehyd, 2 ~ Methyl ~ 4 ~ (2! 6,6-trimethyl ~ 1 ~ cyclohexen ~ 1-yl) -2 ~ butena!l ortho- MethoxyzimtaEdehyd, SSδ-TrimethyE-S-cyclohexenecarboxaidehyd; 3,7-dimethyl-2-methyl-6-ene octenai, phenoxyacetaldehyde!; ! Decadienal, peony aidehyd (6,10-dimethyl-3-oxa-5,9-undecadien ~ 1 ~ al), hexahydro-4,7-methanoindan-1 ~ CarbOxa dehyd, - 5,9-dimethyl-4, & 2-Methyl- octanal, alpha-methyl-4- (l-methylethyl) benzeneacetaidehyd, δ, 6-dimethyl-2-norpinene-2-propionic aidehyd, para Methyl phenoxy acetaldehyde;2-methyl-3-phenyl-2-propen-1-ai> 3,5,5-trimethyl hexanal, hexahydro-8,8-dimethy -2-naphthaldehyde, 3 ~ propyl-bicyclo [2,2.1]! - hept-5-ene-2-carb aidehyd, 9- Decena !, 3-methyl-S-phenyE-1-pentanai, Methyinonyi acetaidehyd, 1-p-q-menthenes carboxaidehyd, Citrai, LiNa !, 1-DecanaE , Fiorhydra! and 2,4-dimethyl-3-cyciohexen-1-carbox- aidehyd. In a preferred embodiment of the method used to release of fragrance ketones, in particular selected from the group consisting of buccoxime; Isojasmone; Methyl beta naphthyl ketone; Musk indanone; Tonalide / musk plus; Alpha Damascon, beta Damascon, Deita-Damaseon, iso-Damascon, damascenone, Dama Rose, methyl dihydrojasmonate, menthone, carvone, camphor. Fenchone, aipha-ion, beta-ionone, beta-Dähydro- Eonon, Gamma-Methyl so-called ionone, Fieuramon, dihydrojasmone, cis-jasmone, Iso-E-Super, Methyl-cedrenyi-ketone or methyl-cedryEon, Acetophenαn, methyl acetophenone, para-methoxy-acetophenone, Methyi- beta-naphtyi ketone, benzyl acetone, benzophenone. Para-hydroxy phenyE-butanone, Ceiery ketone or Livescon, 6-isopropyidecahydro-2 ~ naphton, dimethyl- octenone, Freskomenth, 4- (i-ethoxy-vinylJ SSSδ.-tetramethyl-cyclohexanone, methyl heptenon. 2- ( 2- (4-Methyl -3-cyciohexen-1-y> -! propyl> cyc operrtanon, 1- (p-menthene-6 (2> -yl) -1-ρrapanon, 4- (4-hydroxy -! 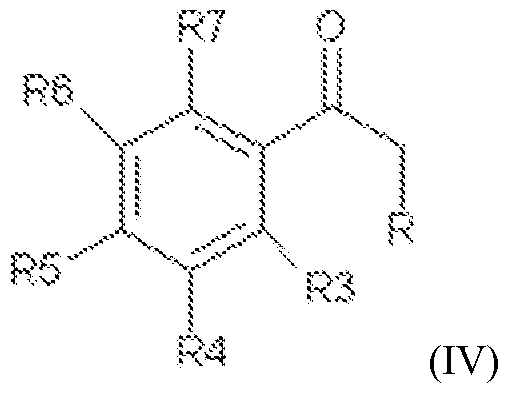 3-methoxyphenyl) -2-butanone, 2-acetyl-3,3-dirnethy norbornane, 6,7-dihydro-1, 1, 2,3,3-penJamethyi- 4 (5H> -indanon> 4 - DamascoE, Duiciny or cassion, Geison, Hexaion, Esocyclemon e, methyl cyciocitron, MethyE- Lavendei ketone, Orivon, Para ~ tert-bu.yi ~ cyclohexanone, Verdon, Delphon, Muscon, Neobutenon, Pücaton, Veäouton, 2 , 4,4,7-tetramethyl! oct-6-en-3-one, Tetra Meran and Hedion. Another object of the invention is a method for long-lasting perfuming surfaces, wherein a composition of the invention is applied to a surface and to beduftende said surface then comprising the wavelengths of 200 to 400 nm is exposed to electromagnetic radiation. If it is, the composition is a detergent or cleaning agent and the surface to be perfumed to textile substrates, or to hard surfaces, so this is a preferred embodiment of the invention. as a fragrance precursor in detergents and cleaning agents, in which the radicals R, R1, R2, R3, R4, R5, R6, R7, R8 are defined as already indicated. as a fragrance precursor in cosmetic products, where the radicals R, R1, R2, R3, R4, R5, R6, R7, R8 are defined as already indicated. as a fragrance precursor in air fresheners, where the radicals R, R1, R2, R3, R4, R5, R6, R7, R8 are defined as already indicated. It is particularly advantageous that fragrance precursors of the invention may also extend the fragrance effect of these fragrances in the presence of additional fragrances. Is the aforementioned use therefore directed to the extension of the scent effect of other fragrances, which are also contained in the detergents and cleaning agents, cosmetic products or air fresheners, so this is a preferred embodiment of the invention. Likewise, there is a further preferred embodiment of the invention, when the aforementioned use is directed to the achievement of a long lasting fresh odor. Also subject of the present invention is the use of the inventive composition for the improvement of perfume efficiency, in particular textiles. As already described, fabric softeners are preferred compositions according to the invention. An inventive fabric softeners can usually contain a softening component. It is particularly preferred that the softening component is an alkylated quaternary ammonium compound, at least one alkyl chain is interrupted by an ester or amido group. For example, the softening component includes quaternary ammonium compounds such as monoalk (s) yltrimethylammonium compounds dialk (en) yldimethylammonium compounds, mono-, di- or triesters of fatty acids with alkanolamines. wherein in (A-II) R 4 alkyl or hydroxyalkyl radical is an acyclic alkyl group having 12 to 24 carbon atoms, R 1 is a saturated C-C, R 2 and R 3 either the same as R or R 1 is or an aromatic radical stand. X ~ represents either a halide, methosulfate, methophosphate or phosphate ion and mixtures of these. Examples of cationic compounds of the formula (II) are monotallowtrimethylammonium chloride, Monosteary- Itrimethylammoniumchlorid, didecyl dimethyl ammonium chloride, ditallow dimethyl ammonium chloride or dihexadecyl ammonium chloride. Compounds of formula (A-III) and (A-IV) are so-called esterquats. Esterquats are characterized by excellent biodegradability. 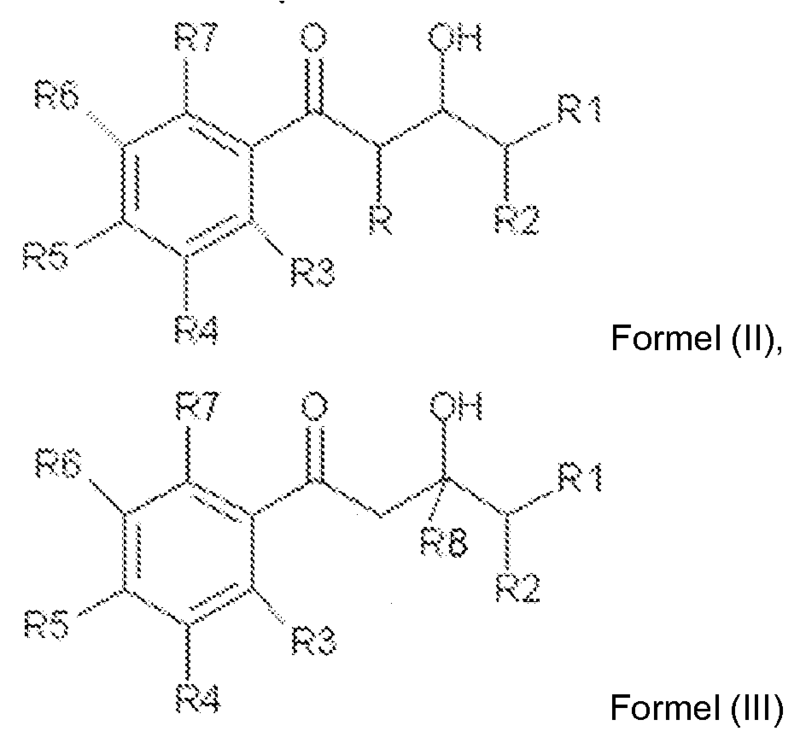 In formula (A-III), R 4 is an aliphatic alk (en) yl group containing 12 to 22 carbon atoms with 0, 1, 2 or 3 double bonds and / or optionally having substituents; R 5 is H, OH or 0 (CO) R 7, R 6 independently of R 5 is H, OH or 0 (CO) R 8, wherein R 7 and R 8 independently of one another each represent an aliphatic alk (en) yl radical having 12 to 22 carbon atoms having O, 1, 2 or 3 double bonds, m, n and p each independently have the value 1, 2 or 3rd X "can be either a halide, methosulfate, methophosphate or phosphate ion and mixtures of these anions. Preferred are compounds in which R 5 represents the group 0 (CO) R 7. Particularly preferred in which R 5 the compounds of the group represents 0 (CO) R 7 and R 4 and R 7 alk (en) yl radicals having 16 to 18 carbon atoms. 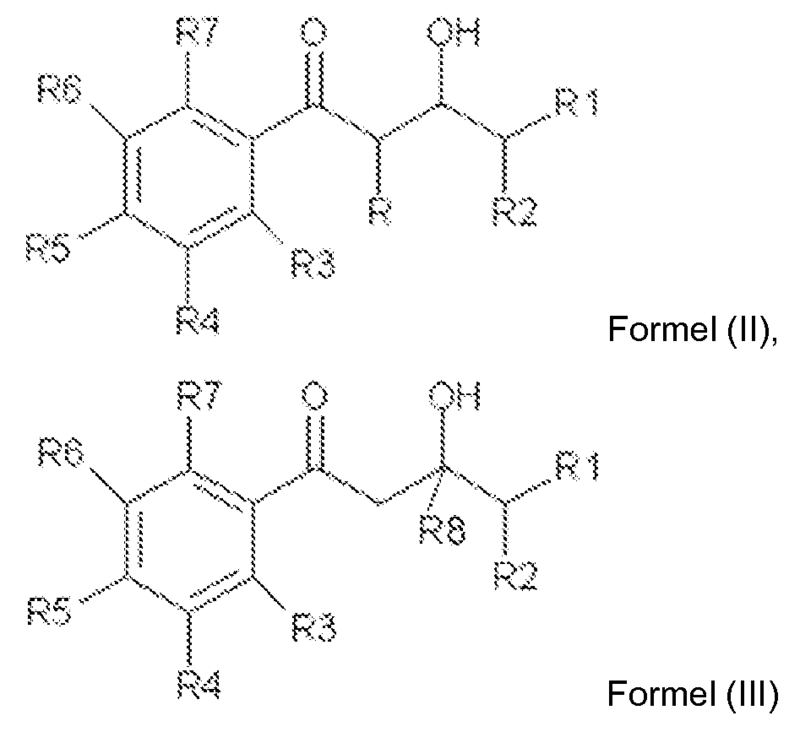 Particularly preferred examples of compounds of the formula compounds in which R 6 is also OH. (A-II) are methyl-N- (2-hydroxyethyl) -N, N-di (talgacyloxyethyl) ammonium methosulfate, bis- (palmitoyloxy) - hydroxyethyl-methyl-ammonium methosulfate, 1, 2-bis [talgacyloxy] -3-trimethylammonium - panchlorid or methyl-N, N-bis (stearoyloxyethyl) -N- (2-hydroxyethyl) ammonium methosulfate. Are used quaternized compounds of the formula (A-III) which have unsaturated alkyl chains, the acyl groups whose corresponding fatty acids have an iodine value between 1 and 100, preferably between 5 and 80, more preferably between 10 and 60 and in particular between 15 and 45 and which have a cis / trans isomer ratio (in wt .-%) of greater than 30: 70, preferably greater than 50: have 40: 50 and in particular equal to or greater than the 60th Commercial examples are sold by Stepan under the tradename Stepantex ® methylhydroxyalkyldialkoyloxyalkylammonium or those known under Dehyquart ® Cognis products, known under Rewoquat ® products from Degussa or those known under Tetranyl® products of Kao. Further preferred compounds are the diesterquats corresponding to formula (A-IV), the 222 LM or CR 3099 are available under the name of Rewoquat® W.
R 21 and R 22 independently of one another each represent an aliphatic radical having 12 to 22 carbon atoms with 0, 1, 2 or 3 double bonds. Instead of the ester group 0 (CO) R 22, wherein R 22 is a long chain alk (en) stands yl, softening compounds can be used which have the following groups: RO (CO) N (CO) R or RN (CO) comprise and of these groups N (CO) R groups are preferred. In addition, cationic polymers are suitable softening component. 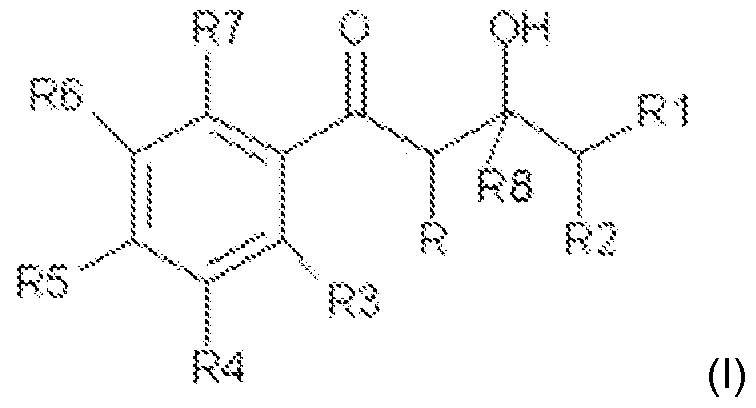 Polyquaternized polymers (for example Luviquat Care from BASF) and also cationic biopolymers based on chitin and derivatives thereof, for example, under the trade designation Chitosan® (manufacturer: Cognis) polymer obtainable. Particularly preferred softening components are alkylated quaternary ammonium compounds, of which at least one alkyl chain is interrupted by an ester group and / or amido group. Very particularly preferably N-methyl-N- (2-hydroxyethyl) -N, N- (ditalgacyloxyethyl) ammonium methosulfate or bis (palmitoyloxy) -hydroxyethyl-methyl-ammonium methosulfate are. The composition of the invention in the form of fabric softeners may also contain nonionic softening components, such as especially polyoxyalkylene glycerol, polybutylenes, long chain fatty acids, ethoxylated fatty acid ethanolamides, alkyl polyglucosides, especially sorbitan mono-, di- and tri-esters, and fatty acid esters of polycarboxylic acids. In the novel fabric softener composition of the invention than is the softening component in amounts of for example, 0.1 to 80 wt .-%, usually 1 to 40% by weight, preferably 2 to 20 wt .-%, particularly 3 to 15 wt contain%, and the additional perfume included advantageously in amounts of 0.1 to 20 wt .-%, preferably 1 to 13 wt .-%, especially 2 to 8 wt .-%, each based on the total amount of the composition of the invention. The aforementioned softening components can in other inventive compositions, such as washing or cleaning agents, cosmetics, are used, for example, in the aforementioned amounts. As a further component, a composition according to the invention, such as a washing or cleaning agent, in particular a fabric softener, optionally contain one or more nonionic surfactants, and such can be used, which are commonly used in detergents. As an optional non-ionic surfactants are preferably alkoxylated, advantageously ethoxylated, more especially primary alcohols preferably containing 8 to 18 carbon atoms and on average 1 to 12 moles of ethylene oxide (EO) per mole of alcohol can be used, in which the alcohol methyl-branched linear or preferably in the 2-position may be or linear and methyl-branched radicals may contain the mixtures typically present in oxoalcohol radicals. 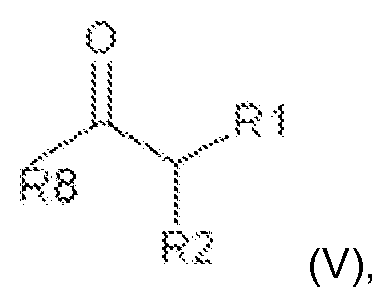 However, alcohol ethoxylates containing linear radicals of alcohols of native origin with 12 to 18 carbon atoms, for example, from coconut, palm, tallow or oleyl alcohol, and preferably on average 2 to 8 EO per mole of alcohol. Preferred ethoxylated alcohols include, for example, C 12 -i 4 alcohols containing 3 EO, 4 EO or 7 EO, n-alcohol with 7 EO, C. 13 15 alcohols with 3 EO, 5 EO, 7 EO or 8 EO, C 12-i 8 alcohols containing 3 EO, 5 EO or 7 EO and mixtures thereof, such as mixtures of C 12 -i 4 alcohol containing 3 EO and C 12-i 8 alcohol containing 7 EO. The degrees of ethoxylation mentioned are statistical averages which may be an integer or a fractional number for a specific product. Preferred alcohol ethoxylates have a narrow homolog distribution (narrow range ethoxylates, NRE). In addition to these nonionic surfactants, fatty alcohols containing more than 12 EO may also be used. Examples are tallow fatty alcohol containing 14 EO, 25 EO, 30 EO or 40 EO. Nonionic surfactants which EO and PO groups together contain in the molecule are used according to the invention. Block copolymers can be employed with EO-PO block units or PO-EO block units, as well as EO-PO-EO copolymers or PO-EO-PO copolymers. Of course, mixed alkoxylated nonionic surfactants can be used, in which EO and PO units are not in blocks but are randomly distributed. Such products are obtainable by simultaneous action of ethylene oxide and propylene oxide on fatty alcohols. 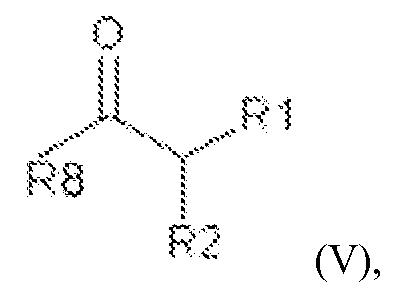 In addition, as other optional nonionic surfactants, alkyl glycosides of the formula RO (G) x employed in which R is a primary linear or methyl-branched, more particularly 2-methyl-branched aliphatic radical containing 8 to 22, preferably 12 to 18 carbon atoms and G is the symbol which stands for a glycose unit with 5 or 6 C atoms, preferably glucose. The degree of oligomerization x, which indicates the distribution of monoglycosides and oligoglycosides, is any number between 1 and 10; x is preferably 1, 2 to 1; 4. The nonionic surfactants may be preferably contained in the inventive compositions in amounts of 0-30 wt .-%, for example in amounts of> 0.1 wt .-%. It is for example possible that the compositions 2 to 30 wt .-%, preferably 7 to 20 wt .-% and in particular 9 to 15 wt .-% may contain nonionic surfactant, wt .-% each based on the whole composition. A composition of the invention may optionally also include an anionic surfactant, for example in amounts in amounts of 0-30 wt .-%, preferably> 0.1 wt .-%. It is for example possible that the compositions 2 to 30 wt .-%, preferably 7 to 20 wt .-% and in particular 9 to 15 wt .-% of anionic surfactant may contain, wt .-% each based on the whole composition. As an optional anionic surfactant can be used for example such of the sulfonate and sulfates. Suitable surfactants of the sulfonate type are preferably C 9-I3 - alkylbenzene sulfonates, olefin sulfonates, ie mixtures of alkene and hydroxyalkane sulfonates and disulfonates of the gaseous they example, from C 12-i 8 monoolefins with terminal or internal double bond by sulfonation with sulfur trioxide and subsequent alkaline or acidic hydrolysis of the sulfonation products into consideration. Particularly preferred anionic surfactants are soaps. Saturated and unsaturated fatty acid soaps such as the salts of lauric acid, myristic acid, palmitic acid, stearic acid, (hydrogenated) erucic acid and behenic, in particular from natural fatty acids, for example coconut, palm kernel, olive oil or tallow soap mixtures derived. The anionic surfactants including the soaps can exist in the form of their sodium, potassium or ammonium salts and as soluble salts of organic bases such as mono-, di- or triethanolamine. Preferably, the anionic surfactants are in the form of their sodium or potassium salts, in particular in the form of the sodium salts. It is further preferred that the composition according to the invention, in particular in the form of a washing or cleaning agent (for example, textile or surface treatment agent) additionally contains further advantageous constituents, which are basically known to the expert. Thus, the composition of the invention may contain further ingredients that improve the performance and / or aesthetic properties of the agent further in particular in the form of a washing or cleaning agent (for example, textile or surface treatment agent). In the present invention, preferred compositions contain (in particular in the form of a washing or cleaning agent), in addition one or more substances from the group of builders, bleaches, bleach activators, enzymes, electrolytes, nonaqueous solvents, pH adjusting agents, perfume carriers, fluorescers, dyes , hydrotropes, foam inhibitors, silicone oils, antiredeposition agents, optical brighteners, graying inhibitors, shrink preventatives, anticrease agents, dye transfer inhibitors, antimicrobial active ingredients, germicides, fungicides, antioxidants, preservatives, corrosion inhibitors, antistatic agents, bitter agents, ironing aids, waterproofing and impregnating agents, swelling and nonslip agents, neutral filler salts and UV absorbers. As builders, (particularly detergent or cleaning agent) may optionally be included in the inventive compositions, for example in amounts of> 0.1 wt .-% (based on the whole composition), for example, silicates, aluminum silicates (especially zeolites), carbonates to mention salts of organic di- and polycarboxylic acids and mixtures of these substances. A compositions according to the invention may optionally include a thickener, eg in amounts of> 0.01 wt .-% (based on the total composition). This corresponds to a preferred embodiment of the invention. The thickening agent may, for example, a polyacrylate thickener, xanthan gum, gellan gum, guar gum, alginate, carrageenan, carboxymethylcellulose, bentonites, wellan gum, locust bean gum, agar-agar, tragacanth, gum arabic, pectins, polyoses, starch, dextrins, gelatin and casein include. Water may be included in the inventive liquid compositions, preferably in amounts of> 5 wt .-%, for example in amounts of from 10-95 wt .-%, preferably 20-80 wt .-%, in particular 30-70 wt .-%, wt .-% based on the total composition. Water may also be included in the inventive solid compositions, then, of course, in a correspondingly lower amount, for example in amounts of <5 wt .-% or, for example, <3 wt .-%. Non-aqueous solvents which can optionally be used in the present invention (preferably liquid) compositions, for example, originate from the group of mono- or polyhydric alcohols, alkanolamines or glycol ethers. The viscosity of the compositions of the invention, so they are liquid may ardmethoden with conventional state (for example, Brookfield viscometer LVT-II spindle 3 at 20 U / min and 20 0 C) are measured, and is preferably 20 to 4000 mPas, with values between 40 and 2000 mPas being particularly preferred. In particular preferably, the viscosity of fabric softeners in the range of 40 to 1000 mPas located. To bring the pH of the composition according to the invention, it is liquid in the desired range, the use of pH adjusting agents may be indicated. Usable are here all known acids or alkalis, provided their use is not precluded for application or ecological reasons or for reasons of consumer protection. Usually exceeds the amount of these 7 wt .-%, or preferably 5 wt .-% not the total formulation. A lower limit may for example be 0.1 wt .-%. The pH of the composition according to the invention, so it is liquid, preferably between 1 and 6 and preferably between 1, 5 and 3.5. When the agents or compositions may be solid or liquid formulations, which may be solid formulations as a powder, granules, extrudate, in tablet form, as a tablet or as a pressed and / or molten form body. The liquid formulations may be solutions, emulsions, suspensions dispersions, microemulsions, gels or pastes. accessible, where the radicals R, R1, R2, R3, R4, R5, R6, R7, R8 are defined as above in connection with formula (I) already shown. 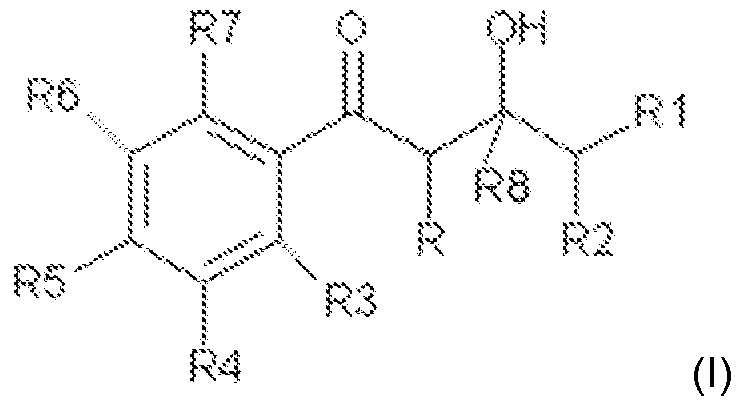 In particular, they are on the route of TiCl 4 / NBu 3 -induced aldol produced (fictional. Y. Tanabe et al, Tetrahedron 58 (2002), 8269-8280). (Petroleum ether: ethyl acetate = 95: 5). Bp. = 175-180 0 C.
(1 H, dq, J = 2.ö, 7.2 Hz), 4:03 (1 H, m), 7:46 to 7:52 (2H, m), 7.53-7.62 (1H, m), 7.93-7.97 (2H, m ). 128.47, 128.77, 133.44, 135.92, 205.98. (2R, 3S) -3-hydroxy-2-methyl-1-phenyldecane-1-one was dissolved in benzene. The reaction solution was ((8 W lamps 4 *), Luxchem Company) in a multilamp Photoreactor exposed with emission maximum λ = 350 nm for one hour. The reaction was followed by GC / MS spectrometry. After at least 60 minutes exposure, the substantially complete conversion of (2R, 3S) was observed -3-hydroxy-2-methyl-1-phenyldecane-1-one in phenylethylketone and octanal. For the sniff test 0.2mmol of (2R, 3S) dissolved -3-hydroxy-2-methyl-1-phenyldecane-1-one in 1 ml of dipropylene glycol. In the solution an odor strip was dipped 2 cm deep, which was then dried in the dark at 20 0 C. In this way, two smelling strips were produced. After successful drying of the first smelling strips over the entire test period of time is using a commercially available fluorescent tube (neutral white (according to DIN 5035 nw); color temperature from 3300 to 5500 K) is irradiated and the fragrance intensity determined at the indicated time points. The second fragrance strip was stored in darkness. The fragrance intensity was of 3 trained panels on a scale rated from 0 to 6, with 6 being the highest score and 0 indicates no odor perception. The results of the smelling tests are shown in the following table, wherein the values ​​indicated reflect the region of the odor perception of the test group. The fragrance strip 2, which has been handled in dark, has neither after 30, 60, 90 minutes and even after several hours of storage (eg 17 hours) a fragrance (corresponding to a value of 0 according to the above scale). but it turned out that the fragrance strip 2 after it was only 17 hours in the dark and then, as indicated above, was irradiated, already after 60 minutes a pleasant fragrance impression caused (according to the value 2 according to the above scale, greasy scale). wherein in this formula, R is independently and R8 represents a hydrogen atom or an organic radical, in particular a linear or branched, substituted or unsubstituted alkyl or alkylene group of Ci to C 2 o, but preferably stands for a methyl radical, and wherein R1 and R2 independently represent a hydrogen atom or organic radicals, such as in particular a linear or branched, substituted or unsubstituted alkyl or alkylene group of Ci to C 20, preferably C 4 to C 20, where the radicals R1 and R2 together may also form a ring system, in particular an unsubstituted or substituted mono- or polycycloalkyl group of C 3 to C 8, or may represent an unsubstituted or substituted phenyl group, and wherein R3, R4, R5, R6 and R7 are independently hydrogen, a halogen atom, NO 2, a linear or branched, substituted or unsubstituted alkoxy group having 1 to 15 C-a Tomen or are a linear or branched, substituted or unsubstituted alkyl group having 1 to 15 carbon atoms. 4. A composition according to any one of claims 1 to 3, characterized in that the wavelengths of 200 to 400 nm is a fragrance aldehyde upon exposure to electromagnetic radiation comprising at least released, in particular selected from the group comprising Melonai, Tripiai, Ligustrai, Adoxai; anisaldehyde; Cymai; Ethylvanülin; Fiorhydral; helional; Heiiotropin; Hydroxycitroneliai; koavone; Laurinaidehyd; Lyra ! ; Methyl-nonyl-acetaidehyd; p, t-Bucinai; Phenyiacetaldehyd; Undecyienaldehyd; Vanii in;! 2, θ, 1Q-trimethyl ~ 9-undecenaE, 3- Dodecefi-1-ai, alpha-n-Amylzimtaidehyd, 4-methoxybenzaldehyde, benzaldehyde, 3- (4-iert- Butylphenyi} -ρrapanal, 2! -methyl-3- (para-rne.hoxyρheny proρana! ), 2-methyl-4- (2,6, δ-.rimethyl-2 (1> - cyciohexen-1-yl) buSanai, 3-phenyl-2 -ρrapenal, cis / trans-3,7-dimethyl-2,6-ocJadien-1-ai, 3,7-dimethyl-δ-octene-1-a !, [(3,7-Dirne.hy! - 6-octenyi) oxy] acetaldehyde, 4 ~ lsopropy! benzya! dehyde, 1, 2,3,4,5,6,7, δ-octahydro-8,8- dimethyl-2-naphtha! dehyde, 2,4- Dirne.hy -3-cyciohexen carboxyaidehyd-1-, 2 ~ methyl ~ 3 ~ (isopropylphenyl) proρanal, decyl aidehyd, 2,6-Dimethy -5-heptenal; -4- (tricycio [5.2 1.0 (2.6. )] - decylidene-8) butanal; octahydro-J-rnethano-IH-indenecarboxaldehyd; 3- ethoxy-4- hydroxybenzaidehyd, ρara-ethyl-a pha, aipha-dimethyihydrozimtaldehyd, aipha-Methyi- 3,4- (methyienedioxy! ) -hydrozirntaidehyd, 3,4-Methyienedioxybenzaidehyd, aipha-n Hexyizimtaidehyd, m-Gymene-7-carboxaidehyd, alpha-Methyiphenyiacetaldehyd, 7-hydroxy-3,7 ~ dimethyl octanai, undecenal , 2,4,6-trimethyl-3-cyciohexene-1-carboxaidehyd, 4- (3) (4-methyl-3- pentenyi) -3- cyciohexen-carboxaidehyd, 1-dodecanal, 2,4-dimethyl cyciohexene- S-carboxaidehyd, 4- (4-hydroxy-4-methyl pentyl-S-cyiohexene-1-carboxaidehyd, 7-methoxy-3,7-dimethyioctan-1-al, 2-methyl undecanal, 2-methyl decanai.1 - nonanal, 1-Octanai, 2! ~ 6.10 ~ trimethyl! 5.9 ~ undecadienai! 2- methy! -3- (44ertbutyl) propanal, Dihydrcxzimialdehyd) 1 ~ methyl ~ 4- (4 ~ methyl ~ 3-pentenyl> -3- cyciohexene-i-carboxaidehyd, 5 or 6 Methoxyhexahydro ~ 4.7 ~ methanoindan-1 or 2- carboxyaidehyd; 3,7-dimethyloctan-1-al 1 -Undecanal, 10-undecene ~ 1-al, 4-hydroxy-3- methoxybenzaidehyd, 1 -methyl-S - ^ - methylpentyiJ-S-cyclohexencarboxyaidehyd, 7- hydroxy-3,7-dimethyl-ocfanai; trans-4-decenai, 2,6-Nonadienai, para-Toiylacefaldehyd; 4- Methyiphenylacetaldehyd, 2 ~ methyl ~ 4- (2> 6 ~ 8-trimethyl-1 cyciohexen-1! ~ y ~} -2 butena> ortho methoxycinnamic SSδ-trimethyl-S-cyciohexenecarboxaidehyd;!. 3.7 öimethyi-2-methyiene-6 octenaE, PhenoxyacetaEdehyd; 5,9-dimethyl-4,8 <tecadienal, peony aldehyde (6,10-dimethyl-3-oxa-5,9-undecadien-1-ai), hexahydro-4,7-rnethanoindan-1-carboxaidehyd, 2 ~ Methyl octanai, alpha- Methye-4- (~ i ! dimethylethyl) benzeneacetaidehyd, 6,6-dimethyl-2 ~ ~ 2-norρinene piOpionaEdehyd s para methyl phenαxy acetaidehyri;! 2-methyl -3-phenyl-2-ρrapen-1 ai s 3,5,5-TrimethyEhexanaä , hexahydro-β.Sd imethyE ^ -naphthaidehyd, 3-Prapy! -bicycio F2.2.1] hept-5-ene-2-carba! dehyd, 9- Decenai. 3 ~ Methyl ~ 5 ~ phenyl ~ 1-pentanai. MethyEnony! acetaidehyd, 1-ρ-menthenes-q carboxaidehyd, Citrai, LiiiaE, 1-Decanai. FEorhydra! and 2,4 ~ dimethyl ~ 3-cyciohexen-1 ~ carboxaldehyde. 5. A composition according to any one of claims 1 to 4, characterized in that the wavelengths of 200 to 400 nm is a Riechstoffketon upon exposure to electromagnetic radiation comprising at least released, in particular selected from the group consisting of buccoxime; Iso -Jasmone; Methyl beta naphthyl ketone; Musk indanone; Tonalide / musk plus; Aipha-Damascone, Beta-Damascone, Delta Damascone, Iso Damascone, Damascenone, damask rose, methyl-dihydrojasrnonat, menthone, carvone, camphor, fenchone, alpha-ion, beta Eonon, dihydro- beta Eonon, Gamma-Methyl so acetophenone called Eonon, FEeuramon, dihydrojasmone, cis-jasmone, Iso-E-Super, methyl-cedrenyl ketone or methyl-cedryEon, acetophenone, MethyE-, para- methoxy-acetophenone, methyl-beta-naphtyE ketone, acetone-BenzyE , benzophenone, para-hydroxy phenyE-butanone, Ceiery ketone or LEvescon, 6 ~ ~ isopropy decahydro-2 naphton, demethyl octenone, Freskomenth, 4 - (- Ethoxyviny!) - 3.3 1 5.5 - ! tetramethyl-cyc ohexanon, Methye-heptenon, 2- (2- (4-methyl-3-cyc ohexen-1-yl) propyl!) - cyciopentanon, 1- (p-menthene-6 (2) -y !) - 1-prapanon, 4- (4-hydroxy-3-methoxyphenyl) -2-butanone, 2-acetylamino -3,3-dimethy norbornane, 6,7-dihydro-1, 1, 2,3! , 3-pentamethyl-4 (5H) -indanon, 4-Damascoi, Dulciny! or cassion, Gelson, HexaEon, Esocyciemon E, Methyi- cyciocitron, Lavendei methyl-ketone, Orivon, Para-tert-bυtyl- cyciohexanon, Verdon, Deiphon, muscone, Neobutenon, Pücaton, Veiouton, 2,4,4,7- Tetramethyi- oct-6-en-3-one, and Tetrarneran Hedion. 7. A composition according to any one of claims 1 to 6, characterized in that it is a washing or cleaning agent, a cosmetic preparation or an air freshener. 8. A composition according to any one of claims 1 to 7, characterized in that at least one surfactant selected from the group consisting of anionic, cationic, nonionic, zwitterionic, amphoteric surfactants or mixtures thereof is or are. 10. The process according to claim 9 for release of Riechstoffaldehyden, especially selected from the group consisting of meiosis! Tripiai. Ligυstrai, Adoxa ! ; Anisaidehyd; Cymai; Ethyivaniüin; Fiorhydrai; Heiionai; heliotropin; Hydroxycitroneüai; koavone; Laurinaidehyd; Lyra ! ; Dimethyl -nony -acetaidehyd! ; p, t-Bucinai; Biphenyl aceta dehyd! ; Undecylenaidehyd; Vani iin;! 2.8,10- trimethyl-9-undecenai, 3-dodecen-1-a !. aäpha-n-Amyizimtaidehyd, 4-Methoxybenza! dehyde, benzaldehyde, 3- (4-tert-Butylphenyi} -prQpanai, 2-methyl-3- (para-methoxyphenylpropanai). 2-methyl-4- (2,6 l 6 -trimethyi-2 (1) -cyciohexen-1 ~ yl) butanal, 3-phenyl-2-propenal, cis- / trans-3,7-dimethyl-2,6-octadien-1-al, 3,7-dimethyl -δ-octen-1-al, e (3,7-dimethyl-6-octenyi) oxy] acetaldehyde, 4-EsopropyEbenzyaidehyd, 1, 2,3,4,5,6,7,8-octahydro-8,8 ! - dimethyl-2-naphtha dehyd, 2,4-dimethyl-3- cyciohexen-1-carboxyaidehyd, 2 ~ Methyl ~ 3 ~ (isopropyiphenyE) propanaE, Decyi aEdehyd 2,6-dimethyl-5-heptenai; 4-!. (tricycio [5.2 10 (2 5 6>.] ~ ~ decyEidene 8> -butanai; octahydro-J-methano-IH- indenecarboxaidehyd; 3-ethoxy-4- hydroxybenzaidehyd, para-ethyl-alpha, alpha dimethyEhydrozimtaidehyd, alpha- methyl-3,4- (methylenedioxy> -hydrozimtaldehyd, 3.4- MethyEenedioxybenzaidehyd, aipha-n-HexyizimtaEdehyd, m-Cymene-7-carboxaEdehyd. 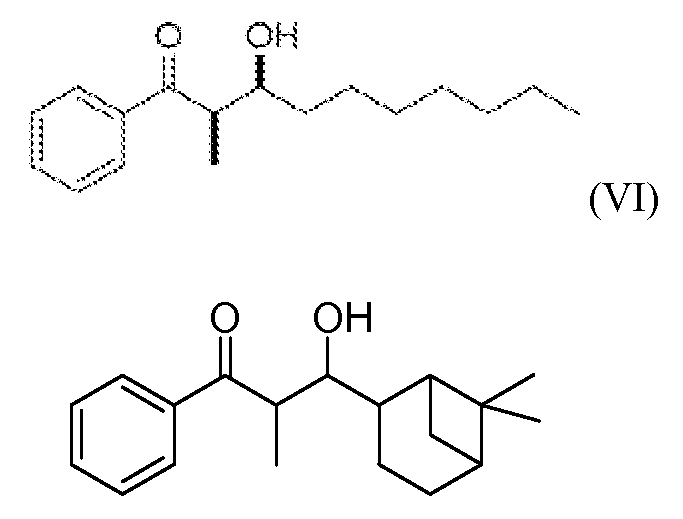 aipha- Methyiphenyiacetaidehyd, 7-hydroxy-3.7-dimethyä octanai, Undecenai, 2> 4.6 -TrEmethyi-3- cyclohexylmethyl-1-ohexene CarbOxa! dehyde, 4- (3) (4-Methyi- 3-pentenyi) -3- cyciohexen-carboxaidehyd. 1-dodecyl canai, 2,4-dimethyl-S-cyciohexene carboxaidehyd, 4- (4-hydroxy-4-methyl-pentyl-S-cylohexene-1 c ^ rboxaidehyd, 7 ~ methoxy-3,7-dimethy! octan-1 ~ aE, 2-methyl undecanai, 2-methyl Decana, 1 -nona- nai, 1-Octanai, 2,6-trimethyl-s 10 s 5 9-undecadienai |! 2- methyl -3- (4 -tertbutyi) proρanai s Dihydrozirnt- aldehyde, 1-methyl-4- (4-methyl-3-pentenyi) -3- cyciohexene-i-carboxaidehyd, 5 or 6 methoxy hexahydro - ^, 7-rnethanoifidan-1 or 2 ~ carboxya dehyd;! 3.7-Dimethyioctan-1 ai, 1 -Undecanai, 10- undecene-1-a !, methoxybenzaldehyde 4-Hydraxy-3, 1-methyl-3- (4-methyl-pentyl> -3! cyc ohexen- carboxaldehyde, 7-hydroxy-3,7-dimethyl-octana ! ; trans-4-decenal, 2,6-nonadienal, para-aldehyde Toiylacet-; -4- Methyiphenyiaceialdehyd, 2-methyl-4- (2 , 6,6-trimethyl -1-cyc ohexen-1-yl) -2-butenal, ortho-methoxycinnamic aldehyde, SSδ-trimethyl -S-cyclohexencarboxa dehyd;!! 3,7-Dimethy -2- methyl ene! -6- octenal, Phenoxyacetaidehyd;! 5,9-Dimethy -4,8-decadienai, Peony aidehyd (6,10-dimethyl-3-oxa-5,9-undecadien ~ 1 ~ ai), hexahydro -4,7-methanoindane-1 ~ CarbOxa! Dehyd, 2-Methyl- octanai, alpha- Meihyi ~ 4 ~ benzeneacetaldehyd (i-methylethyl), 6.6 ~ Dirnethy ~ 2-noφinene-2 ​​~ propion ~ aidehyd, para methyl phenoxy acetaidehyd! ; 2 ~ methyl ~ 3 ~ phenyl ~ 2-ρropen-1 ~ al! 3,5,5-Trlmethyl- hβxanal, Hexahydtx> -8,8-dimethyl-2-naphthaSdehyd, 3-propyl! Bicyclo [2.2.1] hept-5-ene-2-carb aidehyd, θ- decenal , 3-Methye-5-phenyl-1-pentanal, acstaidehyd Methylnonyi, 1-p-q-carboxaldehyde menthenes, Citrai, Linae, 1-Decanai, Fiorhydrai and 2,4-DimethyE-3-cyclohexylmethyl-1- ohexen carbox- aidehyd. 12. A method for long-lasting perfuming surfaces, characterized in that applying a composition according to any one of claims 1 to 8 to a too beduftende surface and said surface then comprising the wavelengths of 200 to 400 nm is exposed to electromagnetic radiation.